Bending, stretching, twisting, lifting — fall lawn care can be rough on your body. But it can also be a necessary evil. When your lawn becomes buried under leaves and other debris, it is deprived of necessities it needs to thrive: water, air and nutrients. Cool-season grasses in particular tend to suffer without the direct sunlight that is vital to its survival. The simple solution? Pick up a rake. 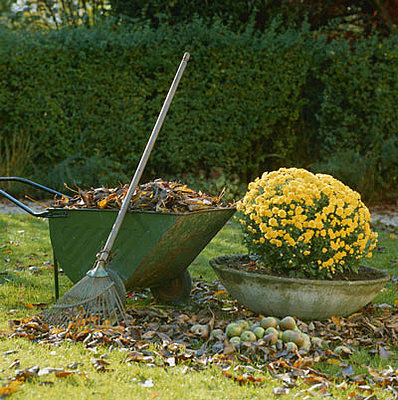 Keep yourself healthy this fall and follow the Texan Insurance tips for raking leaves safely. Do you know what kind of rake you need — Shrub rake? Adjustable? Steel braced? Just as important as the rake itself is the fit. First, make sure that it is an appropriate length for your height. Also, opt for a rake with a rubber grip. (Wooden handles tend to leave splinters otherwise.) For injury prevention, ergonomic rakes are available for purchase at most hardware stores. Clothing should be loose and lightweight, keeping you warm without trapping sweat. Don’t have a rake with a rubber grip? A sturdy pair of gloves will work just as well. For those of you with allergies, you may want to think about wearing a mask to ward off mold, mildew and other outdoor allergens. Footwear should be non-slip, with plenty of tread. With leaves piling up in the yard it can be hard to wait until all branches have emptied. While spot clearing is advisable to avoid slips (and liability), it is better for your body to wait until all the leaves have fallen before tackling the lawn. Often times it is the short, quick cleanups that cause the most injuries because people are more likely to cut corners and use poor posture. Don’t let fall yard maintenance take you down. Texan Insurance has the coverage for all your Home and Health Insurance needs!